This exhibition of paintings, sculptures and drawings marks the London debut of American artist Justin Almquist, who was born in Minneapolis in 1976, received his BFA at Pratt Institute, New York in 1998 and his MFA at the Academy of Fine Arts in Munich in 2010. Almquist has lived and worked in Munich since 2003. In recent years, Almquist has become known for his inspired draftsmanship and the eccentric drawings that stem from a remarkable sensitivity. His drawings meld the real and the imagined in seamless fashion as he shifts between real life studies (particularly portraits) and images discovered in very diverse media, together with a myriad of dream-like allusions. Alfred Kren, one of Almquist’s long-term supporters, wrote recently: “He inscribes fleeting images… while sustaining an unforgiving and exacting mastery of line and colour. He is able to bring us closer to inducing and examining dreams and hallucinations, extracting essentials out of this perishable matter, while still allowing humour and playfulness”. Reflecting another aspect of Almquist’s three-dimensional practice are his Skull Hats – wall pieces made from papier-mâché that he began during his residency at the Chinati Foundation in Marfa, Texas in 2011. These works reflect an interest in Mexican folk art, while keeping the same maverick energy that is so characteristic of the artist. In keeping with his thorough investigation into image and reflection, the exhibition will include some of these objects, together with four paintings from the series Self Portrait with Skull Hat. Almquist’s “sculptural painted collage construction”, the William Blake Blood Mobile, exhibited here for the first time, is a major work that has preoccupied him over the past 12 months. The sculpture emerged from a drawing of the same title made by the artist after glimpsing a blood transport van pass by on the street, inspiring him to ‘redesign’ this utilitarian vehicle in monstrous fashion. Elaborate processes were involved as he extended his painted surfaces outwards, collaging various elements and using high and low tech in a very personal way to produce the work. Justin Almquist is well represented in the permanent collection of the Staatliche Graphische Sammlung Munich, one of the finest and most comprehensive public collections of works on paper in the world. A recent bequest from HRH Duke Franz of Bavaria added a substantial group of drawings by Almquist to this prestigious collection. The Lenbachhaus Munich and the Pinakothek der Moderne Munich have also acquired his works for their permanent collections. Almquist is inspired by various artists, including Francis Picabia, Sigmar Polke and Paul Thek. 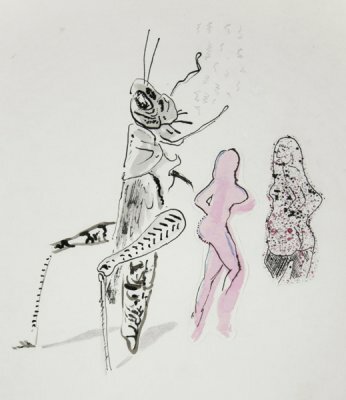 He also particularly admires – and feels an affinity with – the drawings of the British artist Colin Self, whose work he only discovered two years ago. It seemed apt – and is a great pleasure – to show a small display of drawings by Colin Self concurrent with Justin Almquist’s solo exhibition.